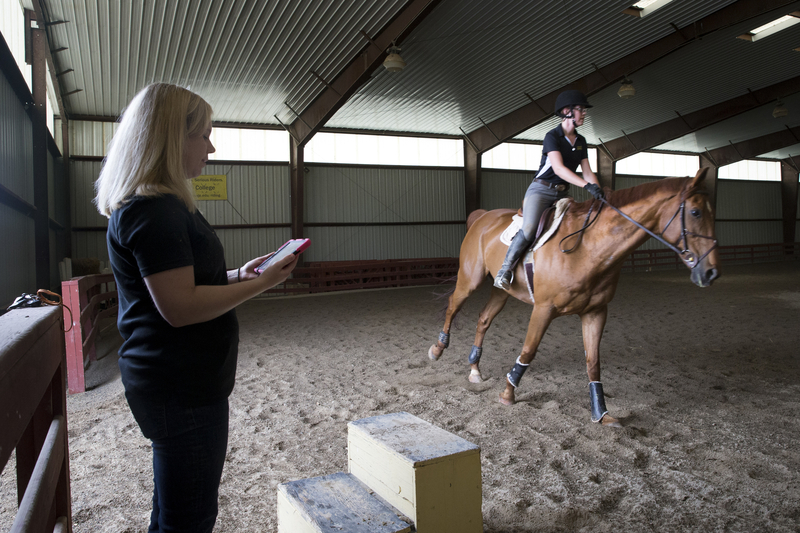 MacKenzi Brown rides one of the horses (Charlie) involved in her Summer Research project while professor Amanda Rumore tracks readings on an iPad. Each morning, MacKenzi Brown ’17 arrives at the Randolph College Riding Center around 8 a.m. to groom and prepare four horses for a ride. But those rides aren’t just for fun–they’re part of a scientific study. Brown, a biology major from Colorado, has teamed up with biology professor Amanda Rumore for a Summer Research project measuring the heart and respiratory rates of those horses. The goal of the project is to find how long it takes for each horse to warm up, or reach its working heart and respiratory rates, and how long it takes to cool down, or return to its resting rates. “It’s about being able to see which factors say that the horse is ready to work, and what exercises will get you to that working heart rate,” Brown said. Rumore, a biology professor and coordinator of Randolph’s equine studies minor, said that the average resting heart rate of horses at the Riding Center is 30-40 beats per minute, and the average working rate is between 150-160 beats per minute. Likewise, the horses have an average resting respiratory rate of 8-12 breaths per minute and a working rate of about 40 per minute. 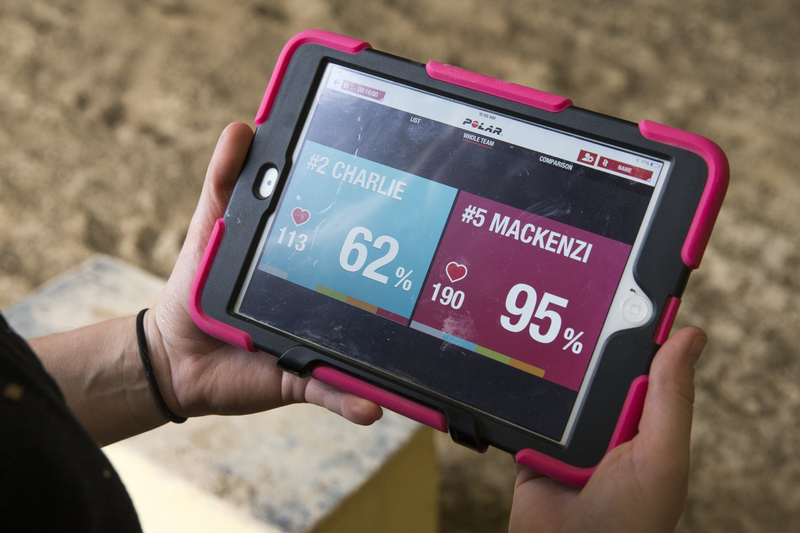 The iPad shows the heart rates of both the horse, Charlie, and MacKenzi Brown during one of their sessions. Brown’s daily rides each last about 45 minutes, and the horses’ heart and respiratory rates aren’t the only things she records during her rides. Besides the obvious changes in those rates that happen when changing riding speeds, she and Rumore film each of her sessions to check both rates at various times and to see if other things she did during the ride might have affected the readings. The study involves two iPads: one that is propped on a tower along the fence in the Riding Center that records the videos, and another that is connected via Bluetooth technology to two Polar Equine Sensor devices called “peanuts” that are placed above and below each horse’s heart. Rumore said the peanuts, which are similar to human Fitbit devices, transmit the heart and respiratory rates wirelessly to the iPad. Rumore said “equine wearables” have emerged in the last decade as the primary and most reliable way to read these rates in horses. She said that Brown, as well as her other equine studies students, are being trained to use this technology, which should prepare them for future equine studies or graduate level research. In addition to the paperwork and registration required by Randolph’s Summer Research Program, Brown and Rumore also had to have their project approved by the Institutional Animal Care and Use Committee, which oversees all animal research. Rumore said even though the project doesn’t require traditional lab testing, the horses are still regarded as test subjects.